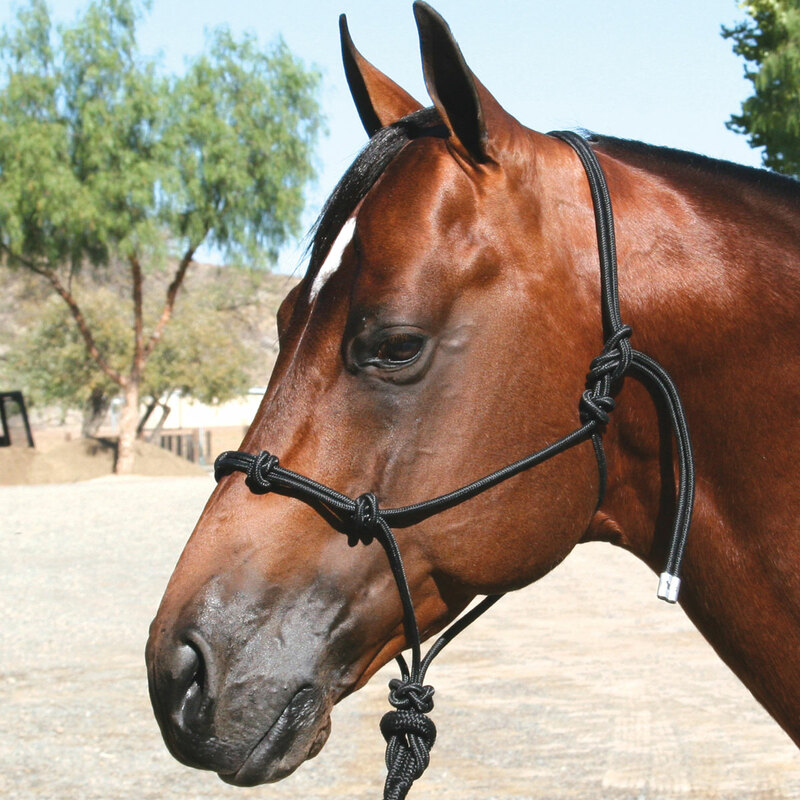 The Professional's Choice Clinician Halter is designed by professionals, this custom-made halter features two strategically placed knots that trigger pressure points on the horse's nose to help maintain control of a difficult or young horse. The halter is slightly rigid, has a smooth finish. Special Features Strategically placed knots on pressure points. Universal Size. Professional's Choice Clinician Halter is rated 4.6 out of 5 by 47. Rated 5 out of 5 by Farmgirl70 from Great rope halter I am very happy with this rope halter and attached leadline. It quickly gets the attention of a naughty horse with a gentle tug. The long and soft leadline is detachable. It will be a help in loading as pressure can be immediately released when the horse complies. Wish I had purchased one ages ago. Rated 5 out of 5 by Kate from Great halter I have a nervous mare who, as soon as this halter is on, behaves much better. She knows not to challenge the knots. Rated 5 out of 5 by Julie from Perfect trainer I got this to help train my horse and he is coming along great and has much improved ground manner. Well built and fits perfectly! Rated 5 out of 5 by Majorbehr from Perfect sizing! I have a large warmblood and this fit him perfectly! Rated 5 out of 5 by Jamie from kinda pricey but very nice Very nice quality. My mare is a cob size and her previous rope halter was cheap and flimsy and I just couldn't get it to fit right. The end on this is kind of long in her once it's tied, but it fits nicely. Rated 5 out of 5 by PFM320 from Effective communication I have been using this halter to teach my young anxious but defiant gelding to go into and stay in the trailer. The way to avoid discomfort is move forward. It's knots are well placed for pressure points that avoid any cruelty and make the point clearly. Thanks to this halter "Jack" loads with limited resistance. Rated 5 out of 5 by Hurd45 from The quality is great and the price was too The quality is great and the price was too. I did buy a popper to add to it. I have no complaints. Rated 5 out of 5 by Dr K from Nice halter I bought this after using a Clint Anderson halter on my horse at a clinic. It does the job of communicating with my sometimes boisterous young horse, and at a much lower price!